Ted Cruz and Donald Trump’s months-long feud may have come to an end on Friday when Cruz, a Trump holdout, endorsed the Republican presidential nominee. The two had a rough road through the primary. Their friendship devolved from allies to worst enemies, and Cruz went so far as to call Trump a “sniveling coward.” After Cruz snubbed Trump during the Republican convention in Cleveland, Trump announced he didn’t even want Cruz’s endorsement. Here's a history of the broken bromance in their own words. — Nov. 20, 2015: Cruz distances himself over Trump’s then-proposed Muslim registry. — Dec. 11, 2015: Cruz blames “establishment” Republicans for goading a Trump fight. — Dec. 11, 2015: Trump goes on the offensive against Cruz for the first time. — Jan. 4, 2016: Trump suggests Cruz’s Canadian birth could present legal challenge to his candidacy. — Jan. 5, 2016: Cruz responds with a "Happy Days" clip of Fonzie jumping the shark. — Feb. 15, 2016: Trump threatens to sue Cruz “if he doesn’t take down his false ads and retract his lies” five days before the South Carolina primary. 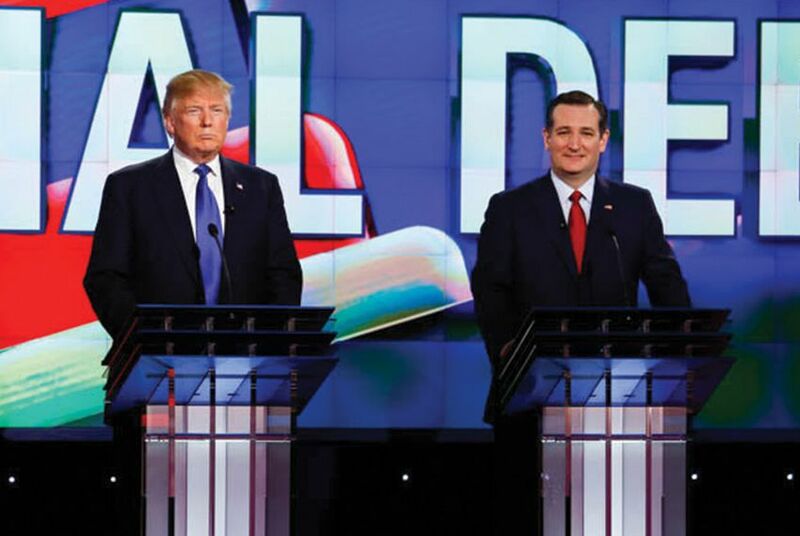 — Feb. 27, 2016: After releasing his own taxes, Cruz presses for Trump to do the same. —March 24, 2016: Cruz hits back after Trump escalates attacks against Cruz’s wife, Heidi Cruz, which began with Trump tweeting a threat to "spill the beans" about her. — April 12, 2016: Cruz compares Trump to the protagonist of the "Godfather" movies. — May 3, 2016: Cruz ramps up Trump attacks shortly before losing the Indiana primary and dropping out of the race. — May 3, 2016: Trump commends Cruz for dropping his presidential bid. — July 20, 2016: Cruz declines to endorse Trump in a primetime speech at the Republican National Convention. “I don't want his endorsement. If he gives it, I will not accept it." — July 22, 2016: Trump slams Cruz for not endorsing him, and suggests setting up super PAC to oppose him in 2020. Ted Cruz will be appearing at Texas Tribune Festival on Saturday, Sept. 24, for a one-on-one discussion with Evan Smith. Watch the livestream here or at Facebook.com/texastribune beginning at 3:05 pm CT.
Ted Cruz might be laying low politically, but this fall he's taking the lead on an obscure issue that could affect ongoing federal budget negotiations. It's a question most Texas politicos aren't used to asking, let alone having to debate: How close, really, is the presidential race in the Texas?